What if a cult song met a cult perfumer? Art, meets artist. What if you could give your favourite song, a fragrance? Art Meets Art. A chic French perfume house, featuring work from four of the world’s top noses. Art Meets Art’s first collection gives multidimensional, sensory life to some of the world’s most timeless songs. Just as a song can capture hearts and minds, so too can fragrance tell stories and bring people together. A recently launched brand, Art Meets Art immediately caught the attention of the likes of Elle and Grazia. Art Meets Art is now rumoured to be the next big thing in the niche fragrance world. Who are the noses behind Art Meets Art’s best-selling fragrances? The man behind Sexual Healing, an oriental vanilla, & Bésame Mucho, a fresh leather fragrance. Raynaud is a perfumer reknowned for some of the best-selling fragrances of the last two decades, including hits from Issey Miyake, Kenzo, Paco Rabanne and Balenciaga. The son of a French perfumer, Pellegrin is known in fragrance communities for being the man who made many cult scents for Diptyque, L’Occitane and Jo Malone. 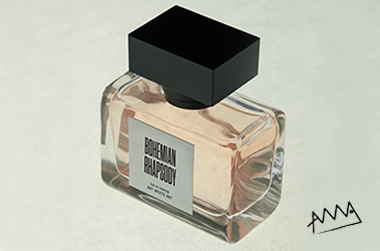 The nose behind Bohemian Rhapsody, an androgynous rose, and Lilac Wine, a masculine lavender-violet fragrance. Born in Germany but raised in France, Voelkl is known for his work with Glossier and Le Labo, creating most of Le Labo’s best-loved fragrances including Santal 33. Creator of Like A Virgin, an airy floral musk, and I Put A Spell On You, a summer-appropriate woody fragrance. A Spanish perfumer who has created fragrances that have changed the perfume industry, such as Marc Jacobs Daisy, CK One, Giorgio Armani Acqua di Gio. He’s worked for years with high end fashion houses like Gucci, Givenchy, Kenzo and Issey Miyake. Love this perfume! The packaging is so cute and I love the combo of music and perfume. The scent is lovely - nice and spicy but fresh. It is a bit pricey but would make a nice special gift or treat for yourself.